Distracted driving is a serious problem in Southern California, and it can result in serious car accidents. Whether you’re talking on your cell phone, texting while driving, or even attempting to use a GPS device, distracted driving can lead to catastrophic injuries. Chula Vista police have been cracking down on distracted drivers. According to a recent article in CBS 8 San Diego, “seventy south bay motorists were facing fines Monday for using their cellphones while driving.” This was the fourth “crackdown operation” conducted by Chula Vista police in April. Have you sustained injuries in a serious automobile accident? Has a loved one been injured in a traffic collision caused by a distracted driver? You may be eligible to file a claim for financial compensation. At the Walton Law Firm, our experienced San Diego car accident attorneys have been handling cases for years and can answer your questions for you today. According to the news report from CBS 8 San Diego, the ticketed drivers were issued citations between 11:00 a.m. and 5:00 p.m. on a Sunday. Fifteen of them were cited for texting while driving, while the remaining 55 were cited for using a cell phone “in some other manner,” according to the Chula Vista Police. This crackdown operation was the fourth in the month of April. On April 10, 15 drivers were cited for texting while driving, while another 60 received citations for cell phone use. Another operation took place on April 17, when 8 drivers received tickets for texting while driving and 44 were issued citations for additional cell phone use. A third crackdown operation took place on April 24, when 83 Chula Vista police issued citations to a total of 83 drivers. Of those motorists, police caught 13 of them texting while driving. The minimum citation for first-time violator is enough to make Southern California drivers think twice, at a high price of $161. For repeat offenders, the ticket increased substantially. Repeat offenders are issued citations of at least $281. In other words, San Diego drivers who use their cell phones will be ticketed for distracted driving. In California, all drivers are “required to use hands-free equipment while talking on their cellular telephones,” according to the California Department of Motor Vehicles. 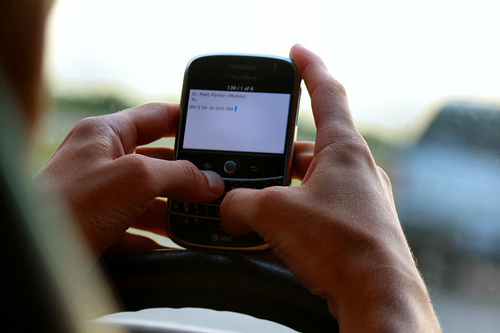 In addition to hand-held talking, texting while driving is illegal in California. In case you didn’t know, there’s a “law against driving while reading, writing or sending a text message,” and the law applies to emails and instant messages, too. Given the devastating statistics connected with distracted driving, the Chula Vista police department may have saved lives and prevented injuries with its recent crackdowns. According to the Centers for Disease Control and Prevention (CDC), more than 9 Americans suffer fatal injuries because of distracted driving everyday, and more than 1,060 sustain serious injuries. All three types of distraction can be very devastating, and they can result in severe accidents. If you or a loved one has been injured in a collision caused by a distracted driver, it’s important to speak to an experienced San Diego car accident lawyer about your case. The injury lawyers at the Walton Law Firm can discuss your case with you today.